Temperature : Max. 47.7° C and Min. 24.9° C in summer.Max. 24.5° C and Min. 9.1° C in winter. 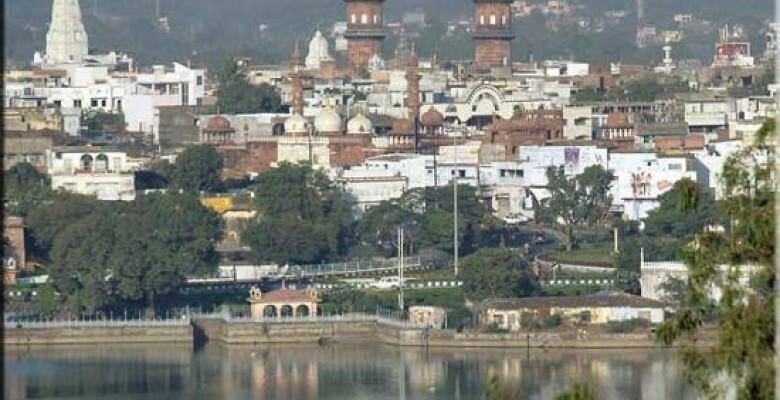 Bhopal, Capital of Madhya Pradesh, combines scenic beauty, historicity and modern urban planning, It is situated on the site of an 11th century city, Bhojapal, founded by Raja Bhoj. The founder of the existing city was, however, an Afghan soldier of fortune, Dost Mohammed. Feeing from Delhi in the chaotic period that followed Aurangzeb’s death, Dost Mohammed met the Gond queen Kamlapati who sought his aid after the murder of her consort. 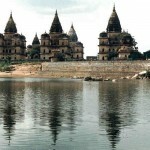 A charming legend relates how the queen would recline` in a lotus barge that, would drift across the lake on moonlight nights, The two lakes of Bhopal still dominate the city, and are indeed its nucleus. Ordered along their shores stand silent sentinels that testify to the growth of a city. 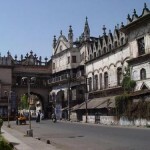 Bhopal today presents a multi-faceted profile; the old city with its teeming marketplaces and fine old mosques and palaces, still bears the aristocratic imprint of its former rulers, among them the succession of powerful Begums who ruled Bhopal from 1819 to 1926. Equally impressive is the new city with its verdant, exquisitely laid out parks and gardens, broad avenues and stream lined modern edifices. 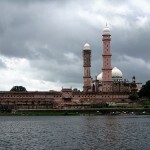 Taj-ul-Masajid: Said to be the largest mosque in Asia, the building of this towering edifice was begum by Shah Jehan Begum (1868-1901) but was incomplete on her death. This great queen, Bhopal’s eighth ruler, left many monuments in the city and to her goes the credit for Bhopal’s postal system, railway and waterworks. 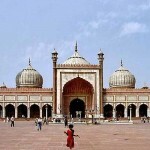 After her death, lack of funds prevented the completion of the Masjid and construction was resumed only in 1971. The most striking features of the mosque are the impressive main hall with its inter-arched roof, broad facade, spacious courtyard and smooth marble floors. A three-day Ijtima congregation held here annually draws people from all over the country. Jama Masjid: Gold spikes crown the minarets of this beautiful mosque, built in 1837 by Kudsia Begum. Moti Masjid: Architecturally akin to Delhi’s Jama Masjid, Sikandar Jehan, daughter of Kudsia Begum, built this imposing mosque in 1860. 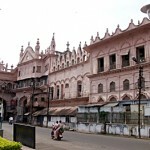 Shaukat Mahal and Sadar Manzil: Situated at the entrance to the Chowk area in the heart of the walled city. Shaukat Mahal is an architectural curiosity. 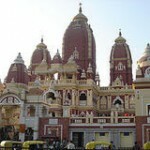 Its mixture of styles in occidental idioms sets it apart from the predominantly Islamic architecture of the area,. 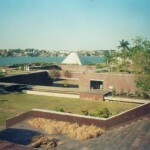 It was designed by a Frenchman, said to be a descendant of an offshoot of the Bourbon kings of France. Post-Renaissance and Gothic styles are combined to charming effect here. 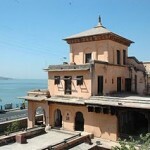 Nearby is the elegant once-opulent Sadar Manzil, Hall of Public Audience of the former rulers of Bhopal. 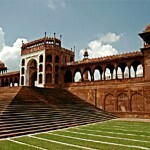 Gohar Mahal: Situated behind Shaukar; Mahal on the banks of the Upper Lake is Gohar Mahal, which is an architectural gem dating back to the thymes of Kudsia Begum, also known as Gohar Begum, who built this sprawling palace in 1820. The Mahal is a magnificent expression of the fusion of Hindu and Mughal architecture. 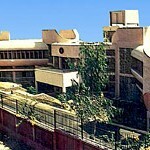 Bharat Bhawan: One of the most unique national institutes in India Bharat Bhawan is a centre for the performing and visual art. Designed by the renowned architect Charles Correa, the contours of Bharat Bhawan merge in exquisite harmony with the landscape; creating a visual impact of spacious and national elegance. The centre houses a museum of the arts, an art gallery, a workshop for fine arts, a repertory theatre, indoor and outdoor auditoria, rehearsal room, and libraries of Indian poetry, classical and folk music. Open from 2 pm to 8 pm every day except Mondays. Tribal Habitat (Museum of Man): An open-air exhibition of tribal house types located on Shymla Hills, the Tribal Habitat is a presentation of actual size dwelling typical of contemporary tribal cultures in various states of India. The exhibition highlights architectural features and has elaborately displayed interiors. The surroundings have been reconstructed to match some of the interesting environmental features of tribal villages. The habitant is open every day except on Mondays and National holidays, from 10 am to 10 pm. 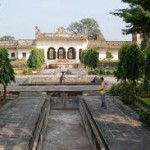 Government Archaeological Museum: Fine collections of sculptures are on display here from various parts of Madhya Pradesh. Highlights of the collections are: paintings of various schools, copies of paintings from the Bagh Caves near Mandu and the statues of Lakshmi and the Buddha. The museum is open from 10 to 5 p.m. on all days except on Mondays and Gazatted holidays. 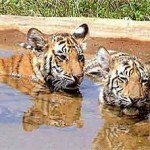 Van Vihar National Park: This safari park is located on a hill adjacent to the Upper Lake, with an area of 445 hectares. In these natural surroundings, wildlife watchers can view a variety of herbivorous and carnivorous species. Open everyday, except Tuesdays, from 7 to 11 am and 3 to 5.30 pm. 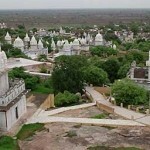 Laxminarayan Temple and Museum: This beautiful temple on the Arear Hills has a museum attached to it, which hoses a collection of sculptures from Raisen, Sehore, Mandsaur and Shahdol districts of Madhya Pradesh. The Museum is open from 9 am to 5 pm on all days except Mondays. Regional Science Centre: Basically a science museum, located on the picturesque Shyamala Hills, Regional Science Centre hoses about 300 participatory exhibits distributed equally in ‘Invention’ and ‘Fun Science’ galleries, and a ‘Taramandal’ (Planetarium). The museum remains open from 10.30 am to 6.30 pm on days except Mondays. Chowk: In the heart of the old city, the Chowk is lined with old mosques and havelis, reminders of a bygone era. The shops in its narrow alleys are treasure troves of traditional. Bhopali crafts silver jewellery, exquisitely fashioned beadwork, embroidered and sequined velvet fashioned purses and cushions. Upper and Lower Lakes: The Upper Lake is divided from the Lower by an over bridge and is six Sq. km. in area. Madhya Pradesh Tourism’s Boat Club on the Upper Lake provide facilities for exciting trips by sail, paddle and motor boats. 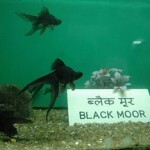 Aquarium: Facing the Lower Lake, the fish-shaped aquarium houses a number of fascinating species of fish in all shapes and sizes. Open all days except Mondays from 3 to 7 p.m.
Islamnagar: 11 km away ad on the Bhopal-Berasia Road Islamnagar was the palace of Bhopal’s Afghan rulers and was built by Dost Mohammed Khan. Formal and was built by Dost Mohammed Khan. Formal gardens surround the palace and pavilion. The latter, a synthesis of Hindu and Islamic decorative art, has columns lavishly embellished with floral motifs. Other monuments to see are the hamam of the Chaman Mahal and the double-storeyed Rani Mahal. 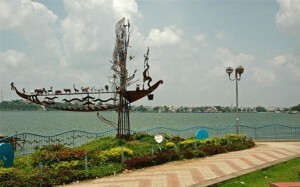 This entry was posted in Bhopal, Madhya Pradesh and tagged Aquarium, Bharat Bhawan, bhopal district, bhopal district map, bhopal tourism, Chowk, Gohar Mahal, Government Archaeological Museum, indian bhopal, Islamnagar, Jama Masjid, Laxminarayan Temple, map of bhopal, map of bhopal city, Moti Masjid, Museum of Man, Regional Science Centre, Sadar Manzil, Shaukat Mahal, Taj-ul-Masajid, Tribal Habitat, Upper and Lower Lakes, Van Vihar, Van Vihar National Park. Bookmark the permalink.